The term "global change" commonly refers to fundamental modifications of climate, ecology and/or socio-economy regarding both the systems` (average) states and dynamics. These changes act on a variety of spatial and temporal scales and potentially lead to qualitative transformations, which can affect human societies to a considerable extent. In addition to these multiple involved scales, the scientific challenge of studying global change is accomplished by the fact that the dynamics of climate, ecology and socio-economy is very complex and involves multiple nonlinear interactions between (i) the aforementioned large-scale systems, (ii) their individual subsystems (e.g., atmosphere, hydrosphere, or biosphere), and (iii) internal (natural) and externally induced (anthropogenically forced) dynamics. This project contributes important knowledge about global change related risks and transformations and their sustainable management. Specifically, it provides a novel methodological framework and subsequent analyses for (i) identifying and understanding the relevant processes determining the ongoing changes in climate dynamics as well as socio-economy, and (ii) systematically assessing the potentials and systemic risks of potential measures for keeping the systems away from critical situations such as dynamical tipping points. Regarding the methodological framework to be developed, the necessity of better understanding the causes and consequences of global change in climate and society requires a holistic and systemic approach to studying the multiple causal interdependences within as well as between the affected systems. In order to achieve this task, this project takes advantage of recent developments from complex systems sciences, specifically nonlinear time series analysis and complex network theory, in order to first develop modern methods for analysis and conceptual modeling based on available data. Subsequently, these methods are applied for investigating fundamental research questions regarding climate variability as well as causal interdependences betweenpolitical decisions and their consequences for climate, environment, and economy detailed in the research plan. 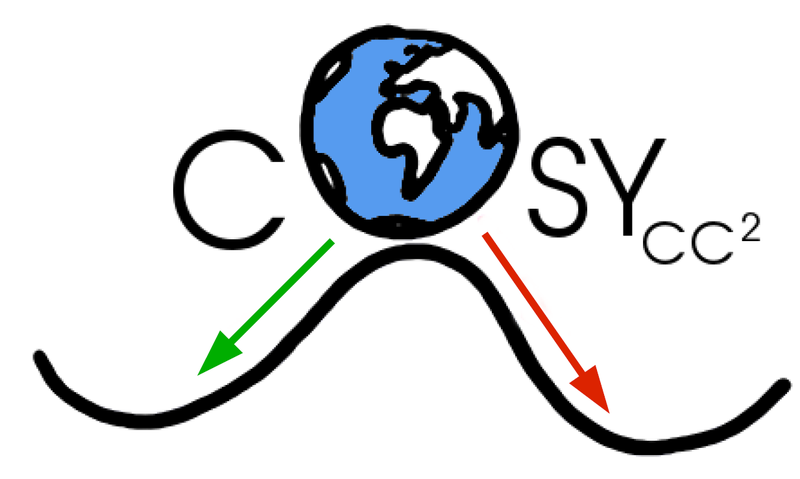 The CoSy-CC2 project does not primarily focus on a highly detailed and realistic modeling of the complex system Earth and human society as a whole, but aims to identify and further study specific components that have a particular relevance for the stability of the overall system and the existence of sustainable transformation pathways. The proposed conceptual approach does not only allow answering several important research questions in climatology (scientific utilization), but also delivers new widely applicable conceptual approaches helping decision makers to evaluate possible consequences of certain actions for the stability of the system prior to their implementation (economic/political utilization). Dynamics and stability of "nature" and "society" as two considerably complex systems have mostly been studied separately so far. This viewpoint has widely ignored the existing complex interdependences between climate, ecology and socio-economy, which call for a holistic treatment of global change related problems. In this spirit, structural and dynamical complexity is a crucial factor that needs to be better understood in order to avoid or at least minimize and manage unavoidable global change in different areas as well as gain a systemic understanding of the impacts of possible actions. 1. Novel concepts from nonlinear time series analysis and complex network theory are collected, implemented and subsequently extended to develop a widely applicable framework for analyzing mutually interdependent climate, environmental and socioeconomic changes in past, presence and future. The rich toolbox of methods is shared with the scientific public based on some open-source software platform. 2. The developed methodological toolbox is used for unveiling relevant variables as well as their mutual couplings in climate and societal dynamics subject to global change. Specific climate change-related research questions to be studied as benchmark examples include (i) the existence of tipping points in the Earth`s climate history, (ii) the discrimination and anticipation of complex signatures of natural and anthropogenic climate change, and (iii) the variability of sea-level on various temporal and spatial scales. By considering both observations and model data, the novel methods provide detailed information about insufficiencies of existing models to be communicated to the respective model developers. 3. Complex network based approaches are used for investigating socio-economic evolution paths with respect to the key structural features of the underlying network of interdependent factors. The obtained systemic knowledge supports political and economic decision making (particularly regarding climate change adaptation and mitigation measures) by making the possible consequences and risks of mutually interdependent decisions transparent. In summary, this project follows a trans-disciplinary approach in order to develop new mathematical tools for assessing relevant processes in climate and socio-economy and apply these approaches for addressing specific research questions in both areas.